More than 60 children and adults gathered in the children’s room on July 17 for an engaging storytelling event with author Geof Hewitt sponsored by the Children’s Literacy Foundation. 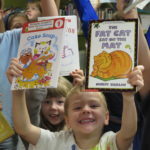 What a treat for each child to choose and take home two free books each to celebrate summer reading! Thank you Geof and the Children’s Literacy Foundation ! ‹ Screech & Hoot with live birds!